Fans of Ubisoft's survival horror Wii U title, ZombiU, may have reason to celebrate. There are hints - and at this stage, hints is all it can be called - that a sequel is in the works. According to a Twitter reveal, Ubisoft is hard at work on a prototype, but Ubisoft Montpellier's Jean-Philippe Caro admits "it's too soon to tell you more." The reveal came in response to a Tweet from a fan, asking whether or not a sequel was pending. Of course, as Caro himself admits in a later Tweet, his job is to work on prototypes that may or may not become games, so there's no telling whether or not this particular dream will come true. 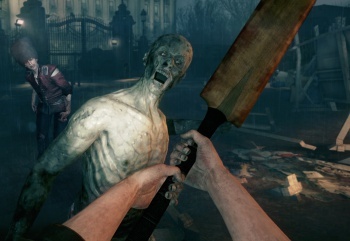 ZombiU, for those out there who haven't played it, is set in post-apocalyptic London. You play as one of a string of ragged survivors, trying to gather the necessary ingredients for a plague vaccine. This was a launch title for the Wii U console, and was favorably received. As to whether or not this maybe-maybe-not title will do wonders for the console's sales figures, anything's possible, and more survival horror certainly can't hurt.